This July 24, 2018, file photo shows a portion of the 1040 U.S. Individual Income Tax Return form for 2018 in New York. Mainers preparing their 2018 taxes are finding out just how President Donald Trump’s Tax Cuts and Jobs Act is affecting them in its inaugural year, and not everyone is happy. While some provisions of the act are helping households with a higher child tax credit, many workers who previously could deduct gas and other expenses not reimbursed by their companies are paying higher taxes because that deduction went away in 2018. So while the act did give taxpayers a tax break, other provisions within the code changes that took effect in 2018 removed valuable deductions, including interest from home equity loans not used primarily for home improvements. 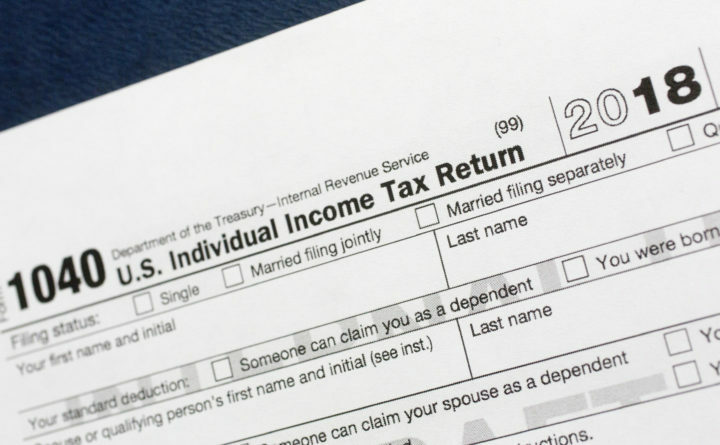 This year, more than others, the amount of taxes due or to be refunded at the end of their tax return has taxpayers scratching their heads. “Just because you have less of a refund doesn’t mean you were taxed more,” said Hilary Clark, staff accountant with CPA firm Edwards, Faust & Smith in Bangor. — An almost doubling of the standard deduction. — Increased tax credits for those with children or taking care of a disabled parent. — Reduction of every tax bracket except the lowest 10 percent to 12 percent tax rate on income up to $9,325. Other tax brackets saw declines of 1 percent to 4 percent. — State and local income tax deductions, which previously had no limit, are capped at $10,000 starting in 2018. That reduces what some taxpayers can deduct on their federal tax returns. — Elimination of miscellaneous itemized deductions. People who travel but have a lot of non-reimbursed expenses, such as long haul truckers, can end up paying more taxes. — Elimination of personal exemptions. While the higher standard deduction works well for an individual filer, it can hurt households. An individual filer in 2017 could have taken a standard deduction of $6,350 and a personal exemption of $4,050, for a total of $10,400. The new tax law takes away the personal exemption, but increases the standard deduction to $12,000. That would bring that individual filer out ahead. But a family of four in 2017 would have had personal exemptions of $16,200, breaking down to $4,050 for each family member, plus a standard household deduction of $12,700. The combined 2017 deduction would have been $28,900. Without the personal exemptions in 2018, they get a standard deduction of $24,000, less than the previous year. Families still may come out ahead if the higher child tax credit offsets their loss of personal exemptions. Also, households with a member older than 65 get an extra $1,300 in the standard deduction. Another notable hit to deductions in 2018 is the home equity loan. Through 2017, interest on those loans could be deducted, regardless of why the loans were taken. As of this year, the loan interest is only deductible if you use the proceeds to improve your home. If you use them for college tuition or to consolidate credit card debt, the interest is no longer deductible. Tax bracket changes also could make a big difference to taxpayers. Those making $37,950 to $91,900 now pay 24 percent income tax, compared with 28 percent in 2017. Overall, Clark said more people have benefited from the tax law change this year than not. “But those benefits decrease over time,” she said of how the tax act is written. And most of her clients who used to itemize — some 80 percent — took the standard deduction this year. “A lot of people are under the mortgage interest, charitable deductions or medical expenses needed to itemize,” she said. Clark said even if taxpayers don’t itemize, they should be sure to enter the property tax rebate on their Maine tax return so they benefit from it. “People should do this even if they are not itemizing,” she said, adding that some people may forget their property tax bill because they aren’t submitting other itemized receipts. Clark gave some examples of how the new tax act is affecting taxpayers by comparing 2017 and 2018 tax returns and making some adjustments for differences in the tax code and rate each year. One client, an offshore oil and gas driller who is married and a joint filer, was hit this year with high unreimbursed expenses that were not deductible. They kept his income high and increased his tax payment by $1,054 to $10,453. Another client, a self-employed lobsterman who is married and filing jointly, made about $14,400 less in 2018 than the year before. Because personal exemptions were eliminated, his taxable income was only reduced by $1,764. Even though his income decreased, his tax payment rose by $631. However, he was able to use the Earned Income Tax Credit for low-income families, and to decrease his 2018 taxes by $908. And a retired married couple filing jointly got a $1,300 boost in the standard deduction because one of them is older than 65. Their tax savings were $1,082 when compared with 2017. Clark said there are tax code changes each year, but this year they were less consistent than other years. Correction: An earlier version of this story included an incorrect number for the standard deduction that households with members older than 65 can claim.